Here is M and a former classmate. Last week in our parent teacher conference M's teacher told us a funny story. One of M's classmates had come up to the teacher and said that M wasn't telling the truth. M had told this child, who is 5 years old, that she is 3 years old, and this child didn't believe her, so he went to the teacher to inform her of what he thought was a lie. The teacher informed the student that yes, M is in fact only 3 years old, but she looks a lot older than she actually is because she is so tall. The kid was stunned. M's teacher then went on to tell us in the conference that sometimes she too forgets how young M is, because she is actually one of, if not the tallest in her class of 3-6 year olds. This is something our girl is going to have to deal with her entire life. In just 4 weeks from now M will be 4 years old. She is a head above most of the kids her age. She is in size 6 clothing (due to her crazy long arms and legs - she can only really wear leggings as pants just fall off of her). She is in a size 11.5 shoe. She looks like she is 6 years old. Whenever I tell anyone how old she actually is they are shocked. But then I go on to explain that her daddy is almost 7 feet tall, and I am 5 foot 9 inches tall, so our kids are going to be giants. I remember when I was young, I was always one of the two tallest girls in my class. I hated it at the time. All the boys were shorter than I was. All of the girls that were liked by the boys were petite and shorter than I was, and I felt like this big freak show towering over all my friends. It wasn't until high school, when the boys caught up with the girls, and I had many more girlfriends my height, that I actually became comfortable with my size. And then marrying a very tall man changed my world and allowed me amass a fabulous collection of 4+ inch heeled shoes...that I can't stand to wear anymore because I am old and prefer flats. Ha. But even at a young age, despite my height, I was always mistaken for being much older than I actually was. Guess how old I am in this photo on the left (with my gorgeous mama)...15. I am only 15! I look like I am in my mid-20s. I used to love that people thought I was much older too, but in fact I was usually the youngest kid in my class. 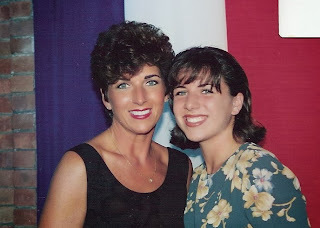 These days I get something totally different - whenever I am out with my mom we are constantly asked if we are sisters. My mother is 61, and I am 34. I will give it to my mom that she looks younger than 61, but sisters? Was I our parents' later in life mistake? I am sure people do it more as a compliment to how good my mother looks, but I get so fired up when it happens - and it happens often. We once even got asked if we were twins. Come on now people!! I worry about M being perceived as being older than she is. I know she is a smart girl, so she will have no problem academically (at least I hope) but she will always be a little more emotionally young than people think she should be. I am not going to lie, sometimes I forget how young she actually is. I expect her to pay attention to me all the time, and do things for herself, and find myself getting frustrated when she can't do things I ask of her. But then I remember that just a year ago she was in diapers (unbelievable to think about) and only a little over two years ago she was starting to walk on her own (she was a late walker)! Conduct you want to sell off a person's rolex replica sale nonetheless could not find a rational web destination where you could public auction them to get a respectable amount? Trying to find a site this promotions completely around royal replica cartier watches in order that it will conduct 100 % justice to the hence pretty personal, liked plus well-kept Rolex timepiece? When you are, a person's investigation is now over! You are going to now not exclusively be capable to sell off a person's replica tag heuer watches for your fantastic amount and be capable to give a person's perfectly retained timeless element in an user which will simply adore plus defend them accurately. rolex replica sale will be diverse issues that happen to be researched if attractive your option for a pre-owned Rolex Look at. People today want your cleanse element that is definitely scrape absolutely free, plus reveals virtually no colouring get. Hence when your element is definitely perfectly retained replica roelx watches includes improved possibility of being sold in the bigger amount.